ICR offers fast turnarounds and in-service warranty coverage options. ICR offers both new and refurbished products. Our refurbished products are priced cost-effectively when compared to new products. Need to retrofit a legacy system? It would be our pleasure to develop a solution tailored to your needs. For over two decades, ICR has offered a comprehensive range of engineering services including robot services, field service solutions, and electronic and mechanical repair. 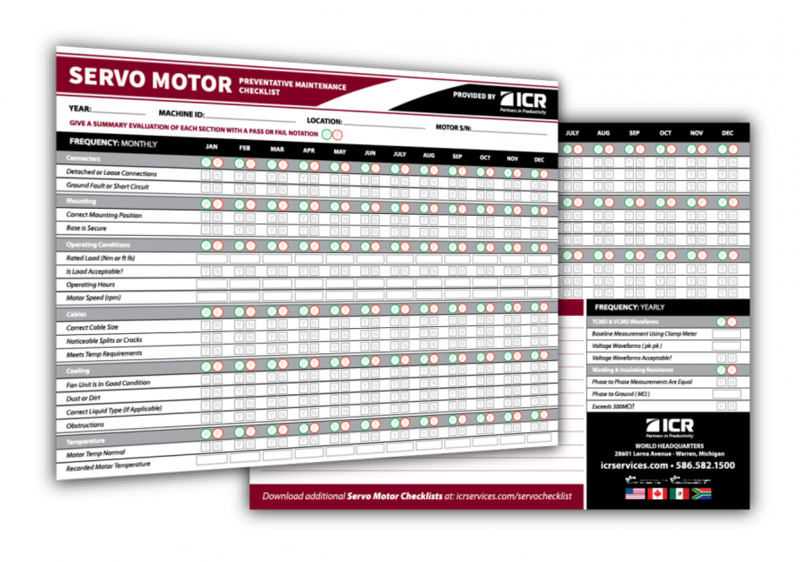 Download the FREE Servo Motor Preventative Maintenance Checklist with monthly inspection tips and procedures put together by our technicians and engineers to get your productivity to its absolute best.